Tim Ash, the Conversion Conference chair, has assembled a panel of CROs from a range of backgrounds to show us what a career in CRO might look like. 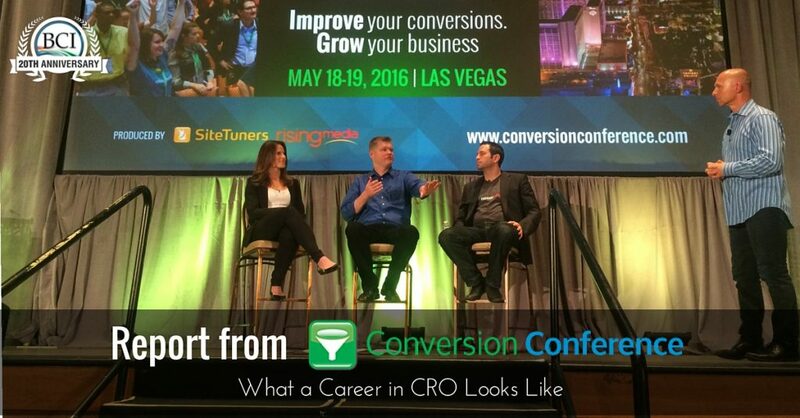 What are the skills a CRO needs to work with you or be you? Alex: Being a CRO consultant requires thick skin to get clients, getting results and keeping cash flow. You learn a lot. The ability to manage projects, manage PNL, and to find contractors to accomplish that. What’s specific to CRO consultant? To streamline your time to get the best results possible. Thinking about the clients and customers to get the best results possible. Much higher pressure on results. What do you look at in a CRO as an employee? Chris: It comes down to a UI systems person. There are CROs that are backend and CROs that are client facing. The back end CROs are very process focused, and comfortable with a system managing you. The front-end is a data-driven sales person, like a sales engineer. You have to constantly sell clients on waiting to call the test, and other coddling. A sales person who is data driven is pretty rare. It’s equivalent of finding a developer who understands marketing. If you’re that person, write your own ticket. Krista: Someone who’s really going to dive into the analytics and find golden nuggets. What’s the most effective way to become a contributor as an entry-level CRO? Alex: Make mistakes early. Have mentors around you that can help you learn. Be in an organization that has some risk tolerance. Chris: They hire people as marketing manager assistants and give a foundation for how to explain starting from the data. It’s important to soak in the data at first and then coming up that will be ingrained. Krista: If you’re just starting out in CRO because it’s becoming part of your job, there’s a good chance that your organization doesn’t have a full-time dedicated CRO person. When she started a new job, she had to be the enthusiastic advocate for doing CRO. Tim: If you’re not passionate about it, if you don’t really want to help visitors to your website have a less painful experience, you shouldn’t be in CRO. How do you manage CROs? Krista: Teams that she’s worked with can struggle to find the meaningful tests. Things she challenges CROs to do is dive into the data and ask the hard questions. Chris: It’s about building a system that manages them and they have a hand in that so the management gets buy in. Testing velocity is a metric that can be objectively tested and gives the CRO a system to manage themselves. Krista: An initiative to have 100 tests in the quarter caused a lot of poor quality tests going out. Tim: What gets measured gets done. People will adjust to the penalty-reward system you put in front of them. An award to the highest test velocity doesn’t account for business outcomes. The focus should be on the quality and not the quantity of the test. More experienced manager will focus on managing systems and processes, not people. Alex: He’s turned designers into CROs, analysts into CROs, and he challenges them to take a decision to its next step — owning the test, presenting to the client, and getting mentorship and guidance from Alex along the way. Young talent tends to play it safe and he pushes people to try new things. Encourage risk-taking as a manger. What’s the biggest challenge you face if you’re a full-time CRO? Alex: Time management. Start with where you’re going to make the most money and then work back from there. It’s about prioritization. Chris: It’s hard to grow the agency. As we grow the company, some structure has to be left behind so someone can come in and take their place as others move up. Asking questions like how do you know what you know? It’s frameworks, checklists – extracting their knowledge and formulating it. Where should CRO ideally live in a company, or to whom does it report? Alex: An early startup he was in didn’t know where CRO went in the organization. Ultimately they built an acquisition team that held CRO. Tim: You could put it under analytics, under product development, under IT … these are difficult. Krista: She’s seen it under product, under research. In large companies, she’s seen it best effective aligned with analytics under marketing. Chris: The Make More Money department. Tim: At SiteTuners they make organizations more mature on CRO. Customer experience, measurement, tools and technology, process and culture, and skills and structure. At the advanced model, it’s reporting to the very top of marketing, the CMO. Not part of the team that touches the web experience. The most dynamic companies have a team reporting to the CMO, and every other part of the company ask them to break, re-break, fix and then give it back. Not part of the team that touches the web experience. Krista: She thinks that Tim’s point about not having CRO as part of the team that touches the web experience keeps the team from being invested. Tim: The problem at the website experience level is that you’re invested in incremental tinkering improvements rather than at the strategic level. Advice for pricing your services? Alex: Move to a retainer model. Get the customer the best results possible in a month time. Start small and then every client you get, raise your price. Chris: If you want to grow and add to your staff, you need to charge more than you think you need to. Add some skin in the game clause – as I increase your revenue, dear client, then I can earn from that as bonus based on performance. This is good for small businesses where you’re dealing with the principles. Tim: This doesn’t work for big businesses because the contract negotiations get caught up on that clause and you lose time when you could be getting more work. Alex: You can also start with packages of tests, like one to three tests to get started. Tim: Goes into retainer after some consultation analysis. Then they have two packages, the high gas package and the minimum required for results. Tim is going to name off job roles and the panel will share their biggest challenge to being an effective CRO. Alex: Be persuasive using data – be direct response focused. Krista: Not being too tied to a perfect message crafted in your head but tie back to what the data tells you. Chris: There are more research-driven copywriters. Chris: Over-complicating will be the weakness. It goes back to Mona Patel’s BS excuse persona of the Scaffolder. (Read the liveblog coverage of Patel’s keynote). Alex: When you’re defining the user journey you focus on understanding the psych for user personas, but may overlook the design aspect. Alex: You may look at the numbers but how do you understand it holistically, melding the qualitative and quantitative. And they may not have the business knowledge to understand how an optimization will affect the business. Krista: She sat on the core team for the Optimize 360 product. A statistician on the team was very vocal about how the test reports would look and the data provided to the user. But she doesn’t think the user needs to see too many details. They wanted to pair it down to the key reports. Tim: Sometimes the numbers lie. Running a test where environmental factors can skew the data. What’s missing is the context of the numbers — the business context. Nice post..Thank you for sharing this information! !